Educated at Haileybury, where Stirling Moss was two years his senior, Mike Parkes left school early to serve an apprenticeship in Coventry where he moved into development of cars. In the late 1962 he moved to Ferrari as a driver and development engineer. During this time he was acknowledged as a leading long-distance driver, and in 1966 Ferrari gave him a chance in Formula One. The faith was repaid when he finished second in the French Grand Prix and followed that with another second in his fourth outing, at Monza. 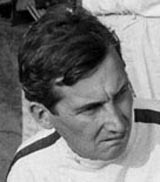 He started the 1967 season strongly with a win in an international race at Silverstone, and he then dead-heated for first in the non-championship Syracuse Grand Prix. However, his F1 career was ended by a crash in the Belgian Grand Prix the following weekend which broke both his legs. He continued racing sports cars into the 1970s and was working as a consultant in Italy when he was killed in a car crash.